The VP-558 is a high-performance 11x4 ProScale presentation scaler/matrix switcher that can output four independent scaled images. Each output includes an HDMI and HDBaseT connector. The product supports analog, digital and embedded audio. VP-558 features six HDMI inputs, four HDBaseT inputs, an analog VGA input, and a 4x1 USB switcher. VP-558 also includes a microphone input, independent stereo audio outputs, a monitor output, an amplified speaker output, and audio DSP features. Pix-Perfect Scaling Technology - Kramer's precision pixel mapping and high-quality full up- and down-scaling technology. Output Resolutions - Up to 1080p/UXGA. System Range - For the HDBT inputs and outputs - up to 70m (230ft). 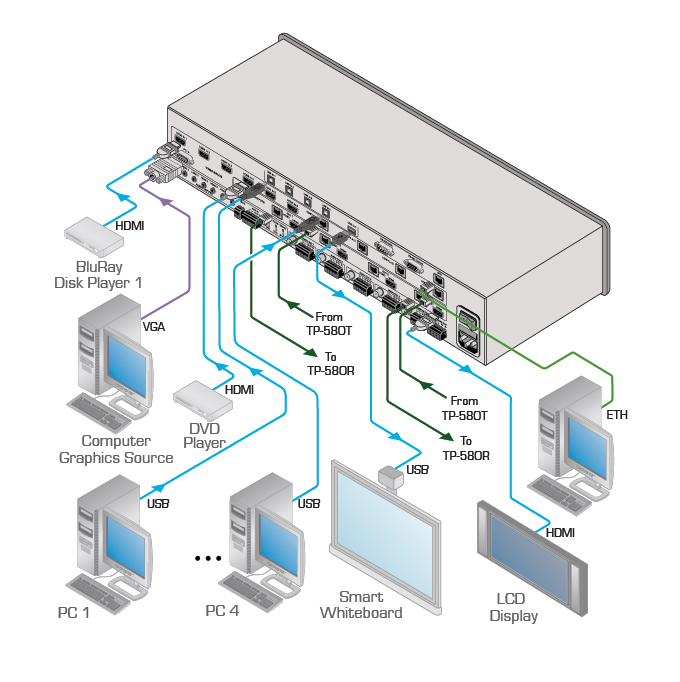 Cables - For optimum range and performance using HDBaseT, use Kramer's BC-HDKat6a cable. Note that the transmission range depends on the signal resolution, source and display used. The distance using non-Kramer CAT 6 cable may not reach these ranges. 4x1 USB Switcher - Can be set to follow the switching of the video layer or as an independent switcher. OSD (On Screen Display) - For easy setup and adjustment, accessible via the front panel buttons. Analog & Embedded Audio Support - For inputs and outputs. Built-in Power Amplifier - 2x10W power amplifier with speaker outputs on a 4-pin terminal block connector. Built-in Web Pages - For easy setup and remote control. Multiple Control Options - Front panel buttons with OSD, RS-232, Ethernet and built-in Web pages. Size - Standard 19" (2U). Rack "ears" included. Dimensions (WxDxH) 19" x 14.4" x 2U rack mountable. Input 6 HDMI connectors, 1 VGA on a 15-pin HD connector, 4 HDBT on RJ-45 connectors, 4 USB ports, 6 unbalanced analog audio on 3.5mm mini jacks for HDMI, 1 unbalanced analog audio on a 3.5mm mini jack for PC, 1 aux in/mic balanced stereo audio on a 5-pin terminal block connector. Output 4 HDBT on RJ-45 connectors, 4 HDMI connectors, 1 USB port, 4 audio out balanced stereo on 5-pin terminal block connectors, 4 audio out S/PDIF on RCA connectors, monitor out balanced stereo on a 5-pin terminal block connector, monitor out S/PDIF on an RCA connector; 1 stereo speaker output, 2x10W into 4Ω, on a 4-pin terminal block connector. Specs 100-240V AC, 70VA max. Humidity 10% to 90%, RHL non-condensing.